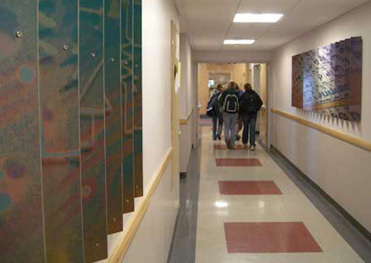 The Art in State Grant program is mandated to spend a percentage of all state building projects on art. Tari Prinster and I teamed up to present a proposal for the $24,000 grant to produce 8 permanent pieces in the Morrill Hall Addition. One of the over arching criteria was that the art should speak to the buildings content and location: class rooms for the Nursing Dept and Argi Sciences. VTC's Randoph, VT campus is in a rural setting. Another criteria was for the art to move the student along the hall. Our proposal won the grant largely because it met this criteria. The corrugated metal substrate housed two photos. 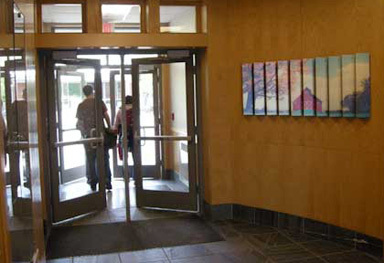 As you move along the hall the first image merges and changes to the second image. 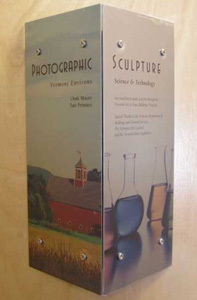 Each panel (6' long or 11' long) paired an environmental image with a science/technology image, thus creating the illusion of movement between science and landscape.